Why did we develop StyleShoots Live? How does the machine utilize AI and robotics technology? Who is StyleShoots Live made for? Is StyleShoots Live designed to replace a photographer? Can I still be creative? How did you develop StyleShoots Live? What camera and lighting equipment is being used in StyleShoots Live? Why did you chose the 1DX mkII? Do you take the stills from the video? Why did you chose the STM lens? What is the depth sensor for? How are the files managed? How does a user switch between shooting stills and video? I want to shoot a model wearing shoes and a bag. How does the machine know what products to film? Does the user work with the camera directly at all, or only through the iPad? What LEDs are being used? How much light do the LEDs deliver? How much can I customize the lighting? What controls (color/brightness/angle) does the user have over the lighting? What aspects of Rotolight's light set-up have been customized, and in what ways? What is the max image resolution? What are the default Aperture settings? What are the default ISO and Shutter settings in Photo mode? How do I move the camera? You say it shoots 4K but I can only export UHD? How big are the exported video files? Do I need custom Video Templates to get a unique look? Could you explain how the video engine takes over the 'time wasting steps involved in a model shoot'? What's so great about being able to shoot video and stills in the same set? Is there anything special involved in directing the model during a shoot? How does the model know what to do? Does the machine know how tall my models are? Can I "save" the details for each model I'm shooting? How much can I customize the stage? Can Live work without a stage? Can I use my own set designs? Do I need my own backdrops? StyleShoots Live is an all-in-one photo and video studio for fashion eCommerce. It has everything a model photography set needs including: state-of-the-art lighting, a high grade DSLR Camera, a customizable stage and an iPad Pro to control it all. We marketed it as the world's first robotic studio. Why? The camera is on a motorized pole which moves intelligently according to the shots that are needed. Both stills and video can be shot using StyleShoots Live. The proprietary software in the machine is able to create a video instantly and applies cuts, fades, transitions and automatically outputs it in whichever ratios and file formats are required. The idea is to simplify everything in a traditional model set. By making it faster and easier for brands, agencies and retailers to create content, they can save money on cost per photo/video and be more creative at the same time. Today, fashion brands need to keep their audience constantly engaged on all fronts with beautiful content featuring their clothes. It’s not just product photography on their web store anymore like we tackled with our first ‘all-in-one’ photo machines, it’s their signage, their social media - their whole visual brand story. We identified a few key bottlenecks for brands wanting to create both stills and videos of live models. Traditionally, brands will have two entirely separate studios for photos and videos, which means, twice the equipment, twice the space, twice the people to operate it, and that models literally have to tiptoe through buildings to get from one set to the next. Once the footage is captured, editing it is very time consuming, especially if you want a consistent high quality in the output. So we decided to find a way to give fashion brands and their creatives an easy to use way to capture live models wearing the latest outfits. And we chose to be much more ambitious than just still images - we wanted to completely reimagine how videos are shot too. We decided to build a smart studio where everything can be controlled from one simple touch interface. 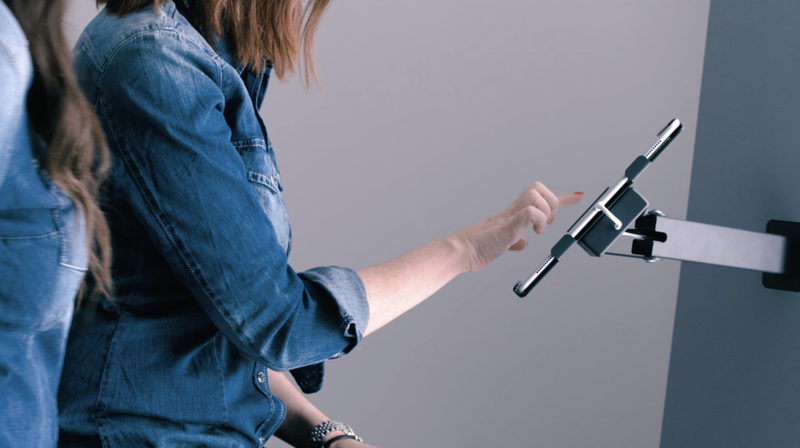 An ‘all-in-one’ photo and video studio that doesn’t need a camera crew to operate it - just a single creative using an iPad. In other words, we wanted to adhere to our philosophy that by simplifying the whole production process, you can get the shoot done and create more content with less resources in much less time. The brain of the machine - what we call the Style Engine™ - is running on a powerful computer within the camera pole where every element of the setup is connected - including camera, lights, and interface. By creating smart algorithms, the machine understands where the product is in the shot, the physical location of the model - even how tall they are - and can adjust all the parameters to make sure you get exactly the shots and movies you’re after. Each brand completely defines their very own style presets to ensure they get exactly the type of videos that match their brand vibe. So when shooting a video, the system knows what kind of clips it needs to create output in the style, length etc you are after, and makes sure that footage is captured. As the clips are recorded, StyleShoots Live intelligently and instantly edits it all together to produce videos ready for watching. It’s essentially a cameraman, a crane operator, and a video editor built into one machine. StyleShoots Live is aimed at fashion brands and retailers that want to not only create better visual content for eCommerce, but keep their fans’ attention on social media. The machine nicely fills that gap between high end editorial campaigns you see featuring models like Gigi Hadid and Cara Delevingne, and catalogue-style pack shots where attention is solely on the product. Simply it’s a creative, easy to use tool for any brand or retailer that needs to create high quality video and stills, faster, cheaper and more efficiently than ever before. No. To run a fashion shoot, you need a creative eye to compose the shot, pose the model and style the clothes - a robot can’t do that. So no, we’re giving those with that creative eye the ability to execute on their vision with speed and ease. Even if the equipment is robotic, the user's creative decisions remain vital. The AI capabilities of the Style Engine™ combined with customizable video styles creates a broad variety in output. As you combine that with how each brand will chose their models, style them, add props in the scene, change the backdrop, add filters, use different lighting configurations, composite shots - the variables all add up to an infinite amount of possibilities. The creative eye of the human photographer isn’t limited, it’s empowered. With StyleShoots Live we have created a powerful and versatile tool that frees up time from all the technical grunt work, and lets stylists and models focus on the creative side of the job. So StyleShoots Live, as a smart studio, is there to give that creative eye a completely blank, easy to use canvas for composing all kinds of content on - from dramatic, magazine style stills to more neutral videos that you’d see on a web store. We began researching, conceptualizing and developing Live over two and a half years before launch, with our in-house team of developers - many of whom come from strong academic backgrounds in imaging technology. We spoke to many of our existing customers to understand the bottlenecks and nuisances of traditional photo studios. We spoke to models, photographers and all those involved in a shoot about how to make them more efficient and more enjoyable. We then took all of this feedback into account when designing every stage of the machine - from materials to the interface and workflow design. When we started the project, most brands were not that much into video yet, but we foresaw the technological development and made sure to include state-of-the-art camera equipment and computing power, to be able to deliver content for any type of modern platform. What camera and lighting equipment is included? To shoot, we’re using Canon’s flagship DSLR, the 1DX Mk II. This is held securely by a camera head with 3-axis movement - tilt, zoom and vertical slide. In there we also have completely custom electronics controlling the camera, mechatronics and lighting. A Mac Pro is also built-in for computing power - with our proprietary advanced image and video processing software based on Apple’s latest Swift and macOS foundations. Surrounding the stage area where the model stands, we have Skylights and and an adjustable Striplight powered by custom designed high-CRI LED panels. To control it all, we have an iPad Pro 12.9-inch with a custom developed user interface. You can view all the technical specifications here. Why did you choose the 1DX Mk II? The Canon 1DX Mk II offers the best tradeoff between reliability, sensor size, picture quality, still frames per second, noise levels, video resolution, video frames per second and color quality. We spent over 2 years producing the product and considered all options on the market. Still photos are captured separately from the videos. Firstly, the resolution is far better - 20.2MP vs 8.3MP if they were taken from a 4K video. Secondly, stills are captured at shutter speed 1/500 to freeze motion. Video requires much lower shutter speeds to get natural looking motion. Lastly, the behaviour of the model is different. Posing for stills is not the same as delivering a smooth and flowing performance for video. So in summary, mixing the two would compromise both formats. Why did you choose the STM lens? The Canon 24-105 STM lens offers the best overall image quality for the purpose, and has built-in aperture compensation when it is zoomed. This ensures we can zoom during and between recordings without having to approximate exposure compensation. The depth sensor is so that the system has an idea of where the model is and how tall they are. All video and photo files are stored on a volume called StyleShoots Drive. When shooting is done, users can flick through previews on the iPad interface, select which ones they want, and export. The files can then be exported into your Digital Asset Management system or workflow of your own choosing. A barcode scanner can be also be used for quick entry of style codes. You can learn more about file management here. What is the Style Engine? What we call the Style Engine™ is the software brain of the machine. It runs on a powerful computer within the camera pole where every element of the setup is connected - including camera, lights, and interface. By creating smart algorithms, the machine understands where the product is in the shot, the physical location of the model - even how tall they are - and can adjust all the parameters to make sure you get exactly the shots and movies you’re after. The powerful engine then edits videos into the right formats with the correct aspect ratios, fades and transitions, depending upon customizable presets. On the live preview screen, all that takes is single tap of the icon in the bottom corner to instantly and seamlessly switch between photo and video modes. How does the machine know what products to record? Say you want to record a model wearing a top, trousers, shoes and a bag, and you want to create a video for each of those products. At the Outfit Creation screen (which is the first step in starting a new session) a user will draw a circle around each of the products that need attention, so the machine knows which elements to make sure are being recorded. Each product will then get it's own movie in the end. The user can only interface with the machine via the iPad interface. The camera is an extremely vital component of the overall piece of hardware, but is fully enclosed inside the system for maximum safety and reliability as there are many internally moving parts and wirings. StyleShoots Live uses a custom-built high CRI bi-color LED system from industry luminaries Rotolight™. The Rotolight LEDs themselves are bi-color, high CRI and are set at 4200 Kelvin - which is proven to be flattering for skin tones. The LEDs are controlled by our proprietary Light Controller® software via the iPad interface. A user simply needs to swipe on the elements in the setup to control the global light balance. At the center model position, we measure between 8.500 - 10.000 Lux at max intensity. There are 3 fundamental ways of customizing the light - angle, intensity and reflection. Striplight - the vertical column at the side of the machine - can be angled to point more to the front of the model or more towards the back wall. It can also be mounted on either side of the machine, to have the main light coming from the left or the right side. Skylight 2 - the top light row sitting closest to the back wall - can be angled upon installation to aim either more down or more upwards. Our installer will per default place it to give the best overall light spread when using the default stage setup. All parts of the Live lighting can be dimmed via the iPad. The Striplight can be dimmed in three sections or a s whole from 0-100%. Skylight 1 (in front of model) can be dimmed as one from 0-100%. Skylight 2 (behind the model) can be dimmed in two sections or as a whole from 0-100%. A two-sided reflector is mounted opposite the Striplight. It has a white side which will bounce back the light and soften the look, and a black side which will absorb light and create a more contrasty look. What controls does the user have over the lighting? For example, colour, brightness, angles? The user has the ability to control intensity and balance of the light. 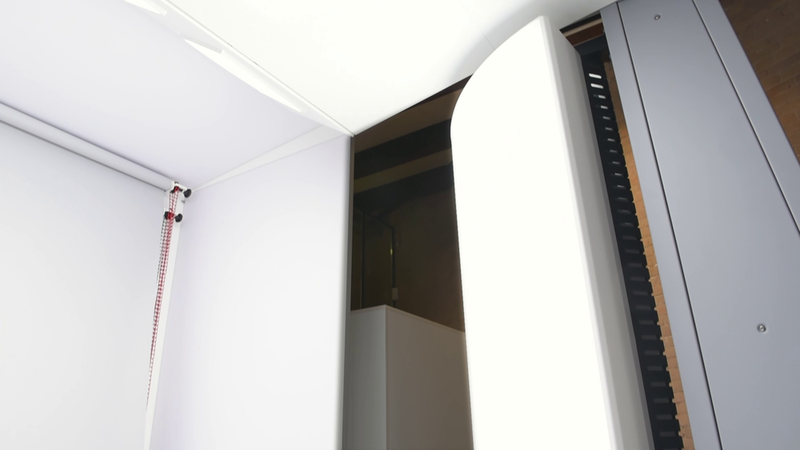 The machine has 6 individually controllable light zones, distributed into a large vertical Striplight, a Skylight 1 illuminating the model's front and the floor and a Skylight 2 illuminating the backwall. The Striplight can be installed either on the left or right side of the machine. In addition to the brightness and balance, the Striplight can be physically pivoted approximately 30˚to aim more towards the model or more towards the backwall. On the other opposite side of the Striplight sits a reflector board that can be swiveled to show either a black or white side. Each of the light boards have removable diffusers and the system is calibrated to ensure correct and consistent colors across both video and stills. The LED system is based on Rotolight's award winning Bi-Color Anova Pro core technology, but with StyleShoots-specific custom LED board design, controller software, housings, passive convection cooling system and power setup. In photo mode, images are captured at shutter 1/500 and ISO 1600 to freeze motion and ensure sharp images. Altering the exposure during a photoshoot to a higher or lower level than default will influence ISO, but the shutter is fixed to maintain sharpness. In photo mode, a user simply needs to make gestures -such as swiping up and down - on the live preview screen to move the height of the camera. The tilt can also be adjusted. Yes. By going into the 'Framings' screen, you can ensure the right framings are set for your shoot to retain consistency across your images. You say it shoots in 4K but I can only export UHD? 4K DCI is ‘true’ 4K in the movie industry, but is a wider aspect ratio than any computer display or digital signage monitor. 4K UHD is slightly narrower, and what is to most people known as ‘4K’. On the machine's iPad we state UHD (Ultra High Definition) simply to be accurate, but in all the ways that matter, it is 4K. You can influence it by tweaking Resolution, File type and Aspect ratio. The complexity of the actual content also factors in. As an example a 1080x1920 (FHD - plenty for most use cases) in .MP4 format, at Best Quality is ~ 2.8MB/sec. So a 8 sec video would be ~ 22MB. This can be configured to be smaller or larger, but it's a realistic example. Uncompressed 4K is close to ~60MB/sec, so there is a broad span of possibilities. In most cases, no. The video templates work merely as a skeleton onto which you add you own flavor and creativity. 80% of the final style of the video will depend on the clothing, the model, the makeup, the movement, the background, the floor and the light - all of which are not in any way controlled by the video template itself. It's easiest to explain it by using an analogy with a production manager and a photographer/videographer. The machine makes the lists of shots that are needed based on what the user tells it. For example, the user (the photographer/videographer) tells the machine who the model is and uses his/her finger to mark the products being shot by drawing on the iPad (for example a jacket and pants), and selects which video templates should be used. The machine then takes all those inputs and attempts to act like a production manager and gives a list of shots that need to be filmed given a selected preset (i.e. a 5 second video with fades and slow mo). The time saving element here is that the machine knows shoes need to be included in the video, as well as the handbag, so can tell the user what needs to be shot - who in turn can direct their model appropriately. Another time saving element is that one single clip can be used in multiple presets, eliminating the need to shoot more than one of the same clips. This for instance applies if you have asked for a short, medium and long version of the video - the machine then makes the most efficient use of recordings. When it comes to other time saving elements, things like constantly readjusting framing and tilt of the camera over and over are handled by the machine. Offloading files from the card of the camera and into editing software is also taken care of, as all editing is done on-board the built-in computer. Only the edited files need handling. Next to this, a lot of repetitive video editing tasks that usually require scripting and keyboard shortcuts, for example applying the same transitions, cuts and adjustments over and over again, as well as handling grading and aspect ratios, are taken care of. Traditionally, brands will have two entirely separate studios for photos and videos, which means, twice the equipment, twice the space, twice the people to operate it, and that models literally have to tiptoe through buildings to get from one set to the next. Once the footage is captured, editing it is very time consuming, especially if you want a consistent high quality in the output. By shooting and handling everything in the same set, time, space and money is saved. How do you direct the model during a shoot? The whole machine was designed around creating a more efficient, easy and fun way of shooting on-model stills and videos. The iPad operator (photographer/videographer) is told what the machine will be shooting next via a combination of icons and simple text cues on the iPad interface. Each recording is like a to-do item on a list. The user is fully in charge of sequence and when to start a recording. There is also a LED ring at the camera which informs the model when shooting begins and ends and what state the machine is currently in. With this information all in front of them, the user can direct the model and talk them through what they will be shooting and how to pose. It's exactly the same as how you'd work with a model normally, only a little more 'high-tech'. You direct them by guiding their movements and briefing them on what look you're after. They do have some guides to help however, with a LED ring indicating the status of shooting. It does indeed. A depth sensor is embedded in the machine that tells it how tall the model is along with an approximation of where they are standing. Absolutely. You can save the model you're shooting along with a picture so you can easily keep shooting the same model. The main dimensions of the stage cannot be altered. The floor can be covered with any material you want, ideally with max thickness of 3-6mm. The back wall can be covered by rolled down paper, or you can build your own set pieces and place them in the Stage. You can also add any props you want, such as chairs, cushions, tables etc. If you plan to hang elements, make sure they are not too heavy for the edges of the Stage top to support them. Yes. The machine does not need the Stage to function. However, the top and side panels of the Stage function as light reflectors, so if you plan to build your own setup, consider adding reflectors to maintain light quality and intensity. Of course. The stage is a creative canvas for you to use any set elements you would like - from fake walls and flooring to lamps, chairs, desks and whatever else you can think of. Our sales team are always on hand to help you pick the right backdrops for the machine when you order, but of course standard photography paper rolls that you'd find in any studio work.